Description: Annual, hemiparasitic, somewhat succulent, glabrous (except floral parts), to about 50 cm tall, with numerous divergent, ascending branches, green or purplish, drying blackish; leaves mostly opposite (especially below), linear, entire, stem leaves 2-4 cm long, 1-1.5 mm wide; inflorescences racemose, bracteate, 4 to 12-flowered, pedicels ascending, glabrous; calyx tube 5-6 mm long, campanulate, calyx lobes narrowly triangular to nearly linear, 5-15 mm long, finely puberulent within; corolla pink, 20-25 mm long, tube 17-21 mm long, lobes 3-5 mm long, rounded-truncate, ciliate, pubescent outside; stamens 4, in two pairs of unequal length, anthers and usually filaments lanate; style about 15 mm long, pubescent; fruit a capsule about as long or slightly longer than the calyx lobes, apex rounded and mucronate; seeds numerous. Flowering September through October. Similar Species: One other species of Agalinis may occur in New Mexico (probably in the northeastern quadrant of the state), but it does not grow in cienegas. Otherwise, Leoncita false foxglove is unlikely to be confused with any other plant. Distribution: New Mexico, Chaves County, Bitter Lake National Wildlife Refuge; Texas, Pecos County, Diamond Y Spring; Mexico, Coahuila, Muzquiz Spring near Parras. Habitat: Perennially moist alkaline/saline/calcareous soils in cienega (wet meadow) habitat around aridland springs and seeps. Remarks: First collected by John M. Bigelow, a physician from Ohio, in 1852 while on the Mexican Boundary survey in West Texas. "Leoncita" refers to a Leon or Leone spring in West Texas where the plant was first found. Presently known from only three widely separated locations. The Bitter Lake, New Mexico, and Diamond Y Spring, Texas, populations are known to be extant, but the Coahuila collection is historical, the species not recently confirmed as still existing there. Two other rare plants, Pecos sunflower (Helianthus paradoxus) and Wrightâ€™s marsh thistle (Cirsium wrightii), often grow with Leoncita false foxglove in New Mexico. Conservation Considerations: Since the species is restricted to cienegas, which are rare and generally declining in New Mexico and West Texas, it is particularly vulnerable to drought and wetland dewatering. Pennell, F.W. 1928. Agalinis and allies in North America. Proceedings of the Academy of Natural Sciences of Philadelphia 80:339-449. Williams, J.E. and J. Henrickson. 1997. In: Henrickson, J. and M.C. Johnston, eds. A flora of the Chihuahuan Desert region, ed. 1.2, 2 vols. Published by J. Henrickson, Los Angeles (trial version for correction). *Poole, J.M., W.R. Carr, D.M. Price and J.R. Singhurst. 2007. Rare plants of Texas: A field guide. W.L. Moody Jr. Natural History Series, number 37. Texas A&M University Press, College Station. 656 pp. Sivinski, B. 2011. 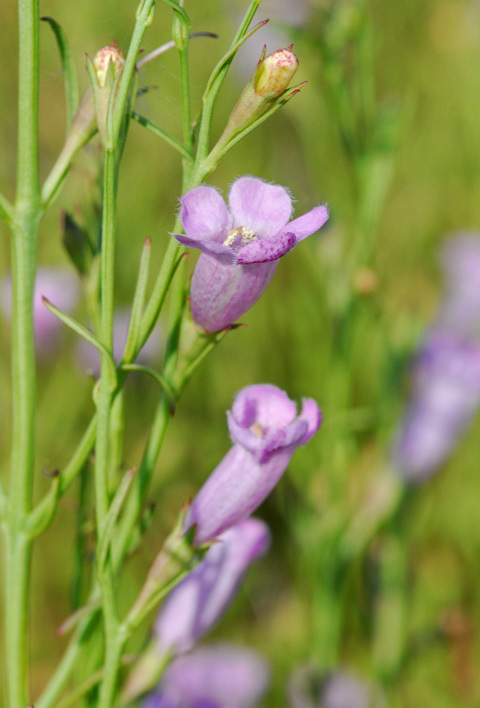 Agalinis calycina (Leoncita false-foxglove): A Conservation Status Assessment.Unpublished report prepared for NM Energy, Minerals and Natural Resources Department and USDI-Fish & Wildlife Service, Region 2.